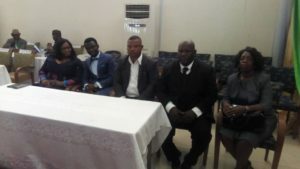 The main opposition All Peoples Congress (APC) lawmakers, who are also members of the Committee on Appointment and the Public Service, yesterday strongly objected to the approval of Human Rights Commissioners on the grounds that the tenure of office for the outgone commissioners was terminated without compliance with the Human Rights Commission Act. The Commissioners were interviewed on the 25th March, 2019, and were expected to be approved on the following day (26th), but the APC lawmakers abstained from the siting, a development that prompted another adjournment. According to the resolution signed by Hon. Chernor R.M Bah, the vetting process of the commissioners were not concluded by the committee, hence they will stand very tall against any act that will bring Parliament to mockery. The opposition Leader said among others that, they abstained from the approval process for the fact that the Commissioners, who the current administration sacked, must be adequately compensated. He said there was a conflict of interest in the appointment of the Chairperson (Mrs. Patricia Nasu Ndanema), who is married to the current Minister of Agriculture, Joseph Jonathan Ndaema. He said the laws of the land must be respected by all despite the positions they occupied. On his part,Hon. Bashiru Silikie of the ruling Sierra Leone Peoples Party (SLPP) stated that people have been yearning for the approval of the commissioners and noted that all of nominees were qualified for their respective positions. He urged the nominees to deliver as President Bio did promise citizens that he would deliver after being elected into office. He said within the next four years, the president will have to submit his scored card, but if nominees fail to deliver well on the president’s agenda, it would tell on his card. Hon. Dr. Mark Mahmoud Kalokoh of APC, said the positions that the Commissioners were going to occupy have not been declared vacant, but that the president had gone ahead to appoint people to serve. Hon. Hindolo M. Gevao of the SLPP said the nominees were qualified for the position, stating that there was no reason to delay their approval as most of them have been serving as Human Rights activists. He noted that before now, Human Rights issues had been a challenge for the Committee in Parliament, which led to robust oversight to all Correctional Services across the country, and that because of their visit, the condition of inmates have changed drastically. He said the Commissioners should be approved to do their work earnestly, thus calling on them to decentralise the work of the Commission in order to address the violation and abuse of human rights across the country. He said for the past ten years, Commissioners have been stationed in Freetown, leaving the needy people in the province to lavish. Deputy Leader of the National Grand Coalition, Hon. Foday Mario Kamara, said citizens voted for change, but that it was pathetic that the change was yet to be reflected as per what they were witnessing. “We want a change and we hope there will be a better change. You must respect the views of others and respect the constitution. We don’t like the procedures. We all should think differently and walk in the interest of the country,” he urged. The nominees include Mrs. Patricia Nasu Ndaema as Chairperson of Human Rights Commission and she would be deputized by Victor Idrissa Lansana. The other commissioners include, Hassan S. Yarjah, Simity Lavalie and Dr. Gassam Abess. The Deputy Speaker, Hon. Solomon Segepor Thomas, who presided on the approval, ordered that full compensation be paid to the outgone Commissioners before their expired term in office. He ordered the Minister of Finance and the Financial Secretary to face the leadership of Parliament to discuss the issue of payment today (Friday, 5th April).